Our latest iPad Solitaire game is now available in the App Store. Goodsol Solitaire 101 was approved, last week, by Apple, so it is now available in the App Store for only $5.99! 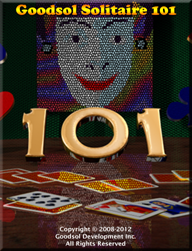 Goodsol Solitaire 101 Touch Edition includes (not surprisingly) the same 101 Solitaire games as the Windows and Mac Editions. Additionally, this version includes 34 bonus game variants, as well as all of your favorites from Most Popular Solitaire Touch Edition and A Little Solitaire. Aside from extra games, Goodsol Solitaire 101 Touch Edition adds new features not available in any other Goodsol product. The deal selection has been adjusted to allow players to select any of more than 2.1 billion deals, which are compatible with Windows and Mac products, but a player can also select to replay a game, and the new result replaces the older one. Additionally, a player can arbitrarily delete individual results, which is a capability often requested by customers. Both of these two features can be expected to make appearances in Windows and Mac OS X products at some point. Before that, though… Pretty Good Solitaire Touch Edition is on its way!